The best sofa covers do not only give the couch an entirely new look but also protect the furniture from unintended damages. While the market offers a wide variety of sofa covers, not all of them are of high quality. In fact, some even get damaged easily. So, how do you choose a good sofa cover? The first thing that will catch your attention is the design. While the sofa covers come in different colors and patterns that could match the interior of your house or your personal preference, these should not be the only deciding factors. The fabric, cost, size, ease of installation, and additional features should also be taken into consideration. To help you out, we have compiled three of our favorite sofa covers in hopes that you will find the one that will suit your needs and preferences. Sofa covers are beautiful add-ons that give a revamp not just of the sofa but also the entire interior décor. They come in various designs, colors, and sizes, which can best match any personal preference. Aside from this function, sofa covers also protect the furniture against scratches, debris, crumbs, and other accidental ruins. As long as the right size is chosen, it will stay tucked in the sofa. The following sofa covers have the best quality not only when it comes to design but also based on convenience and cost. Find out what makes them stand out from the rest. Available in five different colors, the Le Benton Sofa Cover provides a beautiful accent to the sofa and the entire room. Aside from its aesthetics though, there are many more features to like about this product. The Le Benton Sofa Cover is a reversible sofa cover that comes in various colors such as burgundy, brown, black/gray, grey/brown, and grey/burgundy. 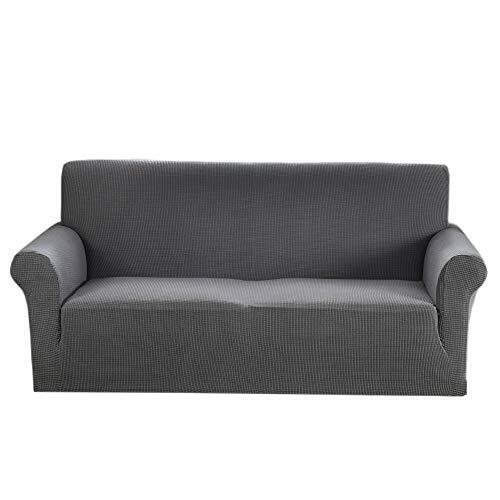 It is intended for oversized sofas with a seat width of 78 inches. 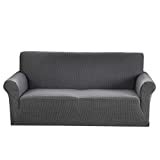 On the other hand, it is also available for love seats of up to 46 inches, chairs of up to 23 inches, and sofas that measure 68 inches long. The Le Benton Reversible Sofa Cover is easy to install in any intended sofa you would like. Simply slip it on and not worry about it slipping off. It is also not prone to wrinkles. With your convenience in mind, this sofa cover is made to survive machine-washing. Simply wash it separately using cold water and mild detergent in a gentle setting. Tumble dry is advisable, but machine-drying is acceptable in the lowest or no-heat setting. The Le Benton Reversible Sofa Cover does not only add beauty to the sofa and the entire home interior, but it also provides protection to the sofa against spills and stains. When it comes to neat-looking, whole sofa body protection, the Chunyi Jacquard Sofa Cover is the best choice. It has various features and indispensable qualities that we definitely love. The Chunyi Jacquard Sofa Cover boasts superior quality. It is made of 85% polyester and 15% spandex fabric, which give the cover more durability and stretch, resulting in both comfort and functionality. When it comes to colors, you can choose from a wide array of unique choices to represent your style and personality. The Chunyi Jacquard Sofa Cover comes in gray, white, smoky blue, light khaki, dark cyan, light yellow, and much more. The Chunyi Jacquard Sofa Cover can fit in most sofas. In fact, it is suitable for sofas between 72 to 92 inches long. Because of its stretchy quality, it can be used on different types of sofas, such as leather sofas, Lawson sofas, T-cushion sofas, and more. One annoying thing about sofa covers is that they slip out of place. This is something that you won’t experience with Chunyi Jacquard Sofa Cover. It features anti-slip foam strips that make the fabric tighter, and it also has a rubberized bottom that keeps the cover firmly in place. The Chunyi Jacquard Sofa Cover protects the sofa from dirt, dust, crumbs, and tear. It can be easily tossed into the washing machine for hassle-free cleaning. Just remember to wash it separately, do not bleach it, and dry in low heat to preserve its beauty. The Argstart Jacquard Sofa Cover is available in different packs for various kinds and sizes of sofas. Is it worth the price, though? Know more about its features, advantages, and drawbacks below. Available in various colors, such as gray, cyan, navy blue, and wine red, the Argstart Jacquard Sofa Cover can match any home decoration and interior. It can also liven up or boost the interior decoration of any abode. This sofa cover is highly durable and a little stretchy, thanks to the fact that it is made with 85% polyester and 15% spandex. It boasts a Jacquard fabric, which gives pretty durable protection to your couch. It is not only comfortable and breathable but is safe and environment-friendly too. The thickness of the cover fabric is 240 grams per square meter. It doesn’t have a smell or scent that could be undesirable for some people. The Argstart Jacquard Sofa Cover can easily fit into various types of sofas, such as extra-large sofas, Ottomans, love seats, and even dining chairs and armchairs. The Argstart Jacquard Sofa Cover is easy to clean. However, you should wash it separately in cold or warm water and a mild detergent. Remember not to use bleach and tumble it dry in no or low-heat setting. With the presence of straps, this cover is easy to put up well on the sofa. All of the three best sofa covers reviewed above are easy to clean and wash. They are machine-washable with cold or warm water and should be tumbled dry on a low-heat setting. 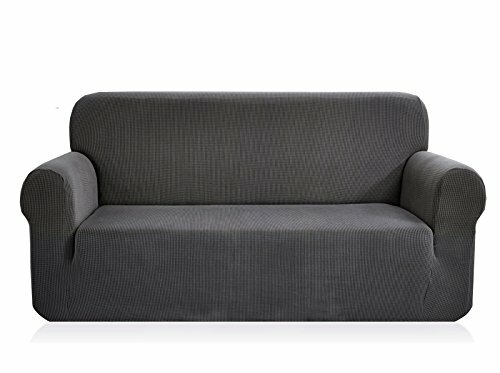 Among the three, the sofa cover that stood out the most is the Chunyi Jacquard Sofa Cover because it has the most unique, practical features. The Chunyi Jacquard Sofa Cover is made with high-quality materials that make it durable and comfortable. It comes with an anti-slip mechanism that keeps the cover in place. It is easy to put up, easy to wash, and the fabric doesn’t easily ruin. It is not only good at adding aesthetics, but it also gives the sofa ample protection.